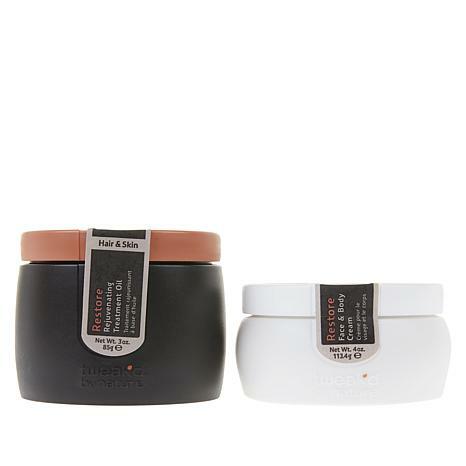 A duo of hair, face and body creams formulated to help moisturize and strengthen dry, delicate hair and skin. - Ritual for your hair: To rejuvenate and revitalize, use once a week or as needed. Scoop a teaspoon into the palm of your hand and rub it between your hands until it becomes an oil. Distribute evenly from scalp to hair ends and repeat until hair is fully saturated. Treat your scalp to a one-to-two-minute massage to help stimulate the hair and scalp. Comb through to ensure all strands are saturated and leave for 20 minutes or more. Can be left in overnight by placing a towel over your pillowcase or wearing a shower cap over your hair. Rinse with warm water. Proceed with a shampoo and conditioner or one of our Cleansing Hair Treatments (sold separately). - Tip: The Rejuvenating Treatment Oil works great at taming frizz, so try one or two drops through your hair to help smooth and add shine. Hair and Body Oil may liquefy at temperatures higher than 86 degrees Fahrenheit. To restore formulation's natural texture, refrigerate product for 60 minutes or allow the product to reach room temperature to solidify. I ordered for the first time and love how it feels on my skin and hair. I used the oil on my hair blow drying and it turn out wonderful when I flat ironed and styled. Also the face and body creme feels wonderful on my face as a night creme. I love the oil and wish so badly this would go on auto-ship! It does wonders keeping my hair hydrated in-between washes and keeping frizz in the hot soFL weather at bay. The face cream is also very hydrating and leaves my face feeling smooth and hydrated. The smell of both is nice. The face lotion does shift in shipping but it is the actual amount advertised. I will definitely buy again! I really like the feel of the face cream, and seems to be very healing and hydrating, but as previous reviewer stated, my jar was also half empty. Big disappointment. Took a photo, but don't see anywhere to share here. May send back for refund at this price! Have not opened the hair oil yet, but used it before and really helps my dry frizzy, naturally curly grey hair. Strong smell though, so if highly sensitive to fragrances I would not recommend. I had to keep reapplying to feel moisturized, not dry. Feels good going on, but doesn't take away dryness on skin. At first, OK, but you have to re-apply very soon. Not worth the effort or money. Re on hair, no better than any similar OTC product.